To Sabbath School teachers: This story is for Sabbath, June 2. Guidance counselor Kelly Stickle stood near the entrance of the Seventh-day Adventist mission school in Alberta, Canada, as First Nations children streamed off the bus on a cold winter morning. “Good morning!” Kelly greeted the children. “Where are you doing? You can’t come in today,” he said, teasing them. Then Kelly felt something on his side, and he looked down. First grader Charlize stood there with a silly grin on her face. Her fingers were stuck in his pants pocket. Charlize giggled and ran off. Twenty minutes later, Kelly reached for his cell phone and felt something unusual in his pocket. 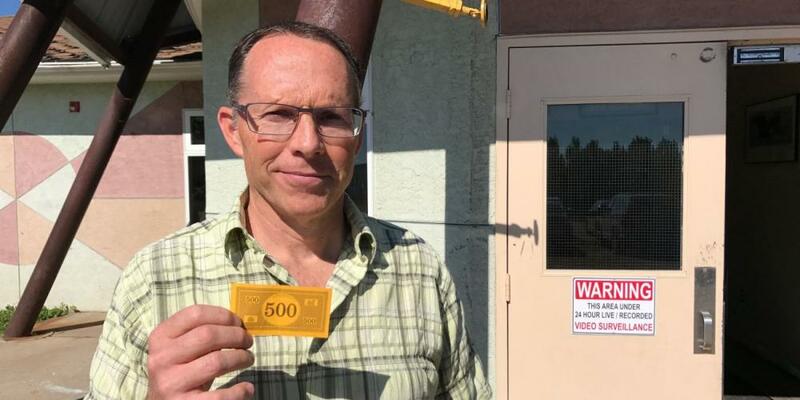 He pulled out a bright-orange $500 bill in Monopoly money. Kelly was surprised. He hadn’t thought that Charlize had put something in his pocket. He had thought that she was reaching in to take out his cellphone. His heart was touched. Kelly spoke in an interview in his office at the Mamawi Atosketan Native School. First Nations artwork and children’s drawings hang on the walls. It’s a room where Charlize spent many hours talking with Kelly during first grade. Just a few weeks into the school year, Charlize’s mother died in a house fire. As is the Cree tradition, the family immediately started a three-day wake to celebrate her life in a meeting hall. The men lit a fire near the mother’s remains and kept the flames burning around the clock. The women prepared food and had it available at all times. Relatives and community members came to pay their respects. After the funeral, no one was allowed to speak the mother’s name for a year. All photos of the mother were placed face down or hidden away. The mother’s life would be celebrated with a feast at the end of the year. Charlize, who was only 7 years old, was not allowed to attend the wake, and she wasn’t supposed to speak about her mother for a year. “She didn’t have a chance to grieve properly,” Kelly said. Charlize began to struggle in the first-grade classroom. She misbehaved. She cried. She argued with her cousin, who was also in first grade. Kelly invited Charlize to his office to visit. The girl drew pictures of her house and good memories of her mother. She played with toys, and she spoke with Kelly. “What happened to my mother?” she asked one day. Kelly spoke about death being a sleep and about the hope of seeing loved ones again at Jesus’ Second Coming. He didn’t know whether Charlize’s mother had believed God, but he reminded the girl that her mother had been a good person who loved others. Charlize stuck the $500 bill into Kelly’s pocket near the end of the school year. That same day, Kelly thanked the girl for the gift and told her it was special. She just smiled. By the end of the school year, she had worked through her grief and was able to say goodbye to her mother. Kelly said that Charlize probably has forgotten the details about what they discussed that year. “But I think that she will remember that Jesus loves her and that there is hope that she will meet Jesus and see her mother again,” he said. Kelly has placed the $500 bill in his Bible, where he uses it as a bookmark. Part of the Thirteenth Sabbath Offering for second quarter 2018 will help the Mamawi Atosketan Native School expand its education program so it can teach more children about Jesus.